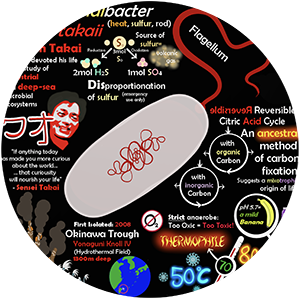 This bacterium is named after Dr. Ken Takai, who is sailing with us on Expedition 376! 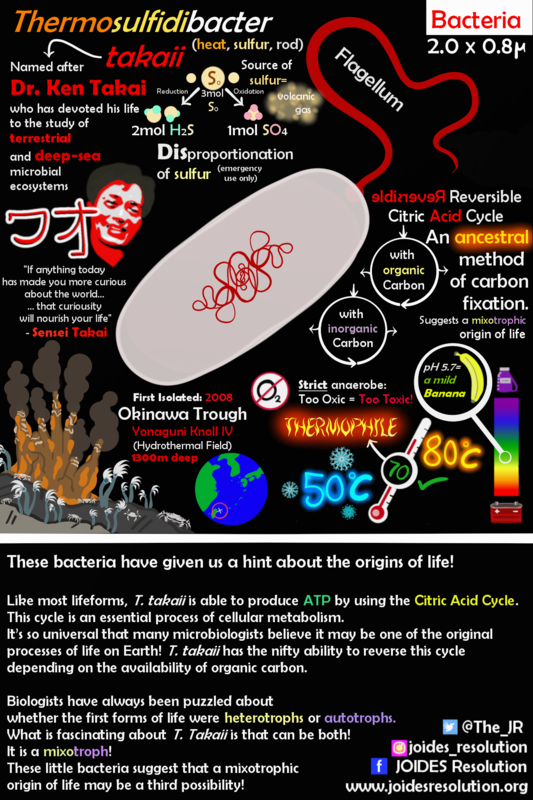 Like most forms of life, T. takaii is able to fix carbon by utilizing the Citric Acid Cycle. This cycle is an essential process of cellular metabolism. Virtually all life uses this cycle to fix carbon and produce ATP (Adenosine TriPhosphate – the energy currency of the cell). In us (humans), it occurs in the mitochondria of our cells. It’s so universal that many microbiologists believe it may be one of the original processes from life’s humble beginnings. T. takaii has the nifty ability to reverse this cycle depending on the availability of organic carbon! Biologists have always been puzzled about whether the first forms of life were heterotrophs (organisms that use organic compounds as a carbon source) or autotrophs (organisms capable of biosynthesizing material from CO2 as a carbon source). What is fascinating about T. Takaii is that it can do both! It is a mixotroph! This little bacterium suggests that a mixotrophic origin of life may be a third possibility!